﻿Measuring just under 1 micrometer in diameter, Ostreococcus (left Figure, bottom panel) claims the title of smallest known free-living eukaryote (Courties et al., 1994). The nuclear genomes of O. tauri (Derelle et al., 2006) and O. lucimarinus (Palenik et al., 2007) are also small, weighing in at only 12.6 and 13.2 megabases (Mb), respectively, and they are predicted to have 7892 and 7651 nuclear genes packed into 20 and 21 chromosomes, respectively. These genomes contain considerably more genes than the relatively simple oxygenic prokaryote Prochlorococcus (1.7 Mb and approximately 1900 protein-coding genes; Dufresne et al., 2003), but they contain only slightly more genes than are found in more complex cyanobacteria like Trichodesmium (7.75 Mb and approximately 6300 total genes). The structure of Ostreococcus genes illustrates the outcome of severe genome compaction. Only one-quarter of gene models in O. tauri have more than one predicted intron, and for the genome as a whole, it is predicted that there are only 1.57 exons per gene, with an average transcript size of 1257 bp. O. lucimarinus has only 20% of predicted genes containing multiple introns with similar exon number (1.27 per gene) and similar transcript size (1234 bp) as its kin. By contrast, the 17 linkage groups of Chlamydomonas (top panel, Figure above) are seemingly awash in excess genetic code. The draft sequence (Merchant et al., 2007) has 15,143 predicted genes over 121 Mb, and the genes appear riddled with introns (average of 7.3 per gene) that extend the average transcript length of 1580 bp to an average gene length of 4312 bp (see Table 1 in Merchant et al. for a detailed comparison). Beyond the contrasting patterns of genome structure, Ostreococcus and Chlamydomonas exhibit unusually high GC contents. The GC content of the O. tauri genome is 58%, while the GC content of Chlamydomonas is a whopping 64% (68% in coding regions!). Another notable feature of the Chlamydomonas genome is its high density of repetitive DNA sequences. Many small silencing RNAs with sequence similarity to transposable elements (TEs) have been found recently in the Chlamydomonas genome (Molnar et al., 2007), along with the first microRNAs described for a unicellular organism (Molnar et al., 2007; Zhao et al., 2007). The green clade of photosynthetic eukaryotes includes Chlorophytes (green algae) and Streptophytes (plants and charophycean green algae). 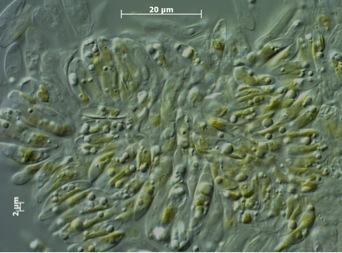 Ostreococcus is a member of the class Prasinophyceae, whereas Chlamydomonas is classified in the Chlorophyceae. The green and red clades share a common ancestor: a heterotrophic eukaryote that en- gulfed a cyanobacterium to generate a plastid through primary endosymbiosis. The scale represents approximate times of divergence as taken from Yoon et al. (2004). The time of divergence of prasinophytes from other Chlorophytes is not well characterized. 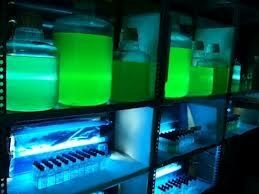 P. tricornutum expressing GFP. 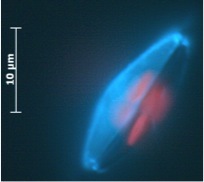 Light microscopical images of cells are shown on the left while their corresponding fluorescence images (GFP) are presented on the right (excitation with UV light). (A) Cytosolic expression of GFP without a targeting sequence. Bars, 2 µm. (B) GFP targeted to the ER (BiPGFP construct). Bars, 2 µm. (C) GFP targeted to the plastids (AtpC1GFP construct). Bars, 2 µm. 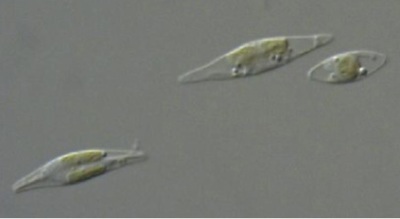 ﻿As a diatom Phaeodactylum is characterized by a photosynthetic apparatus that contains xanthophylls (fucoxanthin) and chlorophylls a/c as dominant light-harvesting pigments (Grossman et al., 1995). 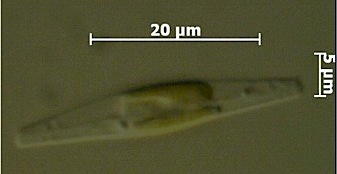 Diatoms and other chromophytic algae also possess ‘complex plastids’ delineated by four distinct membranes (Gibbs, 1979). 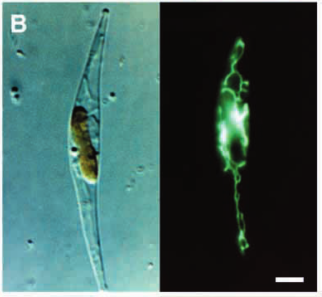 This feature has been proposed to reflect the origin of chromophytic plastids by a secondary endocytobiotic event: that is, engulfment of a eukaryotic alga by a nonphotosynthetic eukaryote that led to permanent residence of the photosynthetic organism within the host cells and subsequent evolution of a plastid. The ancestral chromophytic plastid is thought to be related to red algae (Martin et al., 1998), which themselves arose by primary endocytobiosis (1). 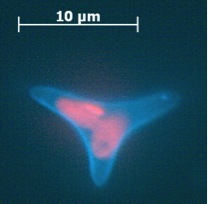 Four membranes delineate the chromophytic plastid. The inner two appear to be homologous to the double membrane envelope of plastids from red algae, green algae and vascular plants. A third unique membrane completely surrounds the plastid envelope and is thought to represent the former plasma membrane of the endosymbiont, while the outermost membrane may have evolved from the vacuolar/plasma membrane of the host organism. This outermost membrane has been observed to be continuous with the endoplasmic reticulum (Gibbs, 1981; Ishida et al., 2000). The portion of this ER-like membrane directly adjacent to plastids (and which appears to completely encase the plastid) is commonly referred to as the chloroplast ER or CER (Bouck, 1965). 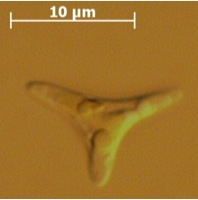 ﻿The ultrastructure of the oval, fusiform and triradiate morphotypes of Phaeodactylum tricornutum Bohlin. The organization and structure of the cytoplasmic organelles is similar in all three morphotypes, except that the vacuoles occupy the extra volume created by the arms of the fusiform and triradiate cells. The frustule in fusiform and triradiate cells is organic; in the oval type it may be organic or one of the valves may have a silica frustule surrounded by an organic wall. In all cells, the organic cell wall has up to 10 silica bands (13 nm wide) embedded in its surface in the girdle region, lacks girdle bands, and has an outer corrugated cell wall layer, except in the girdle region. 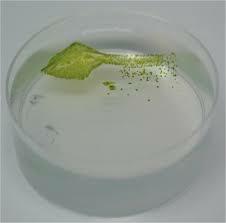 Cell division, organic wall formation and silica deposition have been researched in detail. Four types of oval cells are also described (2). 1.) Oval or ovoid morphotype 2.) Fusiform morphotype 3.) "long-armed" triradiate 4.) Triradiate with unequal arms 5.) "Long" oval/ovoid 6.) "Bent" (lunate) fusiform 7.) "Boomerang" fusiform 8.) "short-armed" triradiate. Apt, K. E., Zaslavkaia, L., Lippmeier, J. C., Lang, M., Kilian, O., Wetherbee, R., … Kroth, P. G. (2002). 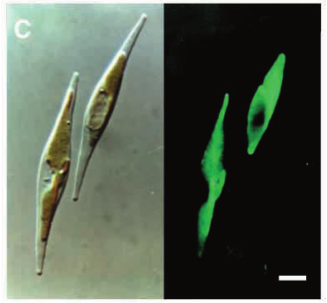 In vivo characterization of diatom multipartite plastid targeting signals. Journal of Cell Science, 115(21), 4061. Borowitzka, M. A., & Volcani, B. E. (1978). THE POLYMORPHIC DIATOM PHAEODACTYLUM TRICORNUTUM: ULTRASTRUCTURE OF ITS MORPHOTYPES 2. Journal of Phycology, 14(1), 10–21. Prochlorococcus is a marine cyanobacterium that numerically dominates the mid-latitude oceans, and is the smallest known oxygenic phototroph. All isolates described thus far can be assigned to either a tightly clustered high-light (HL) adapted clade, or a more divergent low-light (LL) adapted group. They are closely related to, but distinct from, marine Synechococcus. The genomes of 12 strains have been sequenced and they range in size from 1.6 to 2.6 Mbp. They represent diverse lineages, spanning the rRNA diversity (97 to 99.93% similarity) of cultured representatives of this group. Our analyses of these genomes inform our understanding of how adaptation occurs in the oceans along gradients of light, nutrients, and other environmental factors, providing essential context for interpreting rapidly expanding metagenomic datasets. Click for Prochlorococcus genomes list. Click on images of Prochlorococcus microscopy pictures or saltwater medium agar plate and liquid cultures below for more information. The freshwater cyanobacterium Synechococcus elongatus PCC 7942 holds a special place in the development of cyanobacterial molecular genetics. 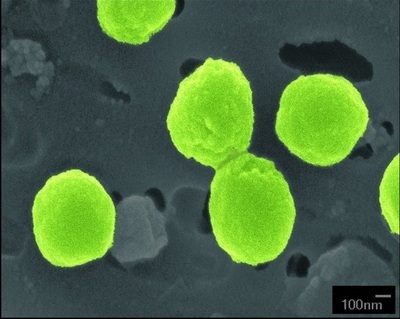 It was this isolate, previously known as Anacystis nidulans R2, that was the first cyanobacterium demonstrated to be reliably transformable by exogenously added DNA (32). 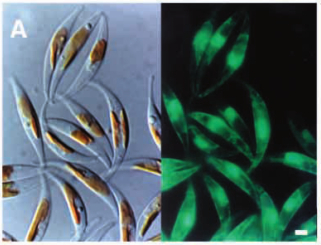 Over the decades, many genetic tools have been developed for S. elongatus, and applied to other transformable cyanobacteria (1, 9, 16). Strain PCC 7942 is very closely related to, and considered the same species as, PCC 6301, which is the type strain for S. elongatus (13) and the first accession in the Pasteur Culture Collection (http://www.pasteur.fr/recherche/banques/PCC/). It is an obligate photoautotroph (13), with a genome of approximately 2.7 Mb (15). Two plasmids (approximately 8 and 46 kb) have been sequenced entirely (GenBank accessions S89470 and AF441790, respectively). S. elongatus has been extensively studied by a multi-national research community with respect to: acquisition of inorganic carbon (2, 8, 20, 22, 33), transport and regulation of nitrogen compounds (19, 23, 36), response to iron deprivation (3, 7, 21, 24, 37), acclimation to a variety of nutrient stresses (5, 6, 12, 27, 28, 31, 35), and adaptation to environmental variations in temperature (11, 14, 25, 26, 30) and light intensity (4, 17, 18, 29, 31, 34, 35). In recent years, S. elongatus PCC 7942 has again taken a pioneering position, as the only developed model system for exploring the mechanism of a prokaryotic circadian clock (10). A companion project to the JGI draft sequence is a functional genomics project (http://www.bio.tamu.edu/synecho/index.html) that aims to inactivate each gene in the genome and identify all loci that are important for circadian rhythms of gene expression in the organism.